The Pharaoh Hound is the national hound of the Island of Malta . Pharaoh Hound native name is the Kelb tal Fenek in Maltese, which means "rabbit hound". Which is the name we have chosen for our house and Boarding Kennels and Cattery. 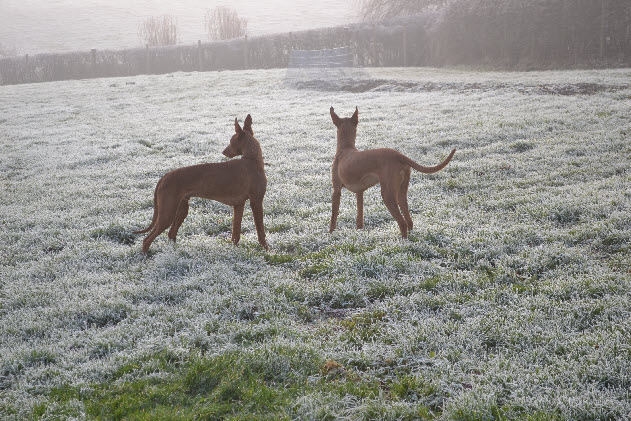 The Pharaoh Hound is the traditional hunting dog of Maltese farmers. The Pharaoh Hound traditionally would be taken hunting at night or dawn in small groups or a team working with a ferret. With its keen sense of smell and excellent eyesight they make a very formidable hunter they do tend to bark “or give voice” so you are able to keep a trace of their progress. 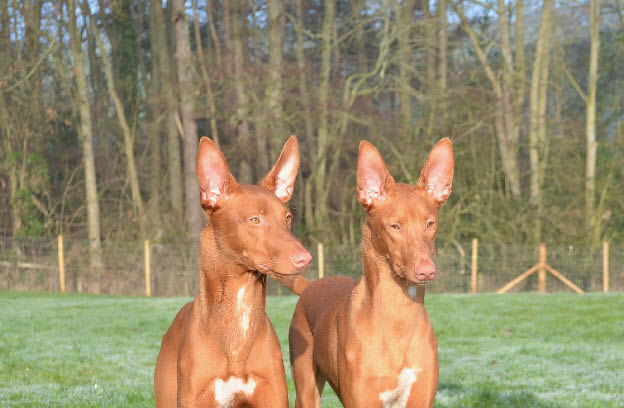 The breed may not have any conclusive links with Ancient Egypt but with Malta’s location in the Mediterranean and the Phoenicians being note worthy mariners and traders the link back to carvings and drawings which detail a pricked eared dog can not just be a coincidence but did the Pharaoh Hound start in Egypt and travel to Malta or Malta to Egypt will never be clear. It has variously been classified as a member of the sighthound group, yet its fieldwork ability clearly determines it as a hound that can work by sent and hearing also. 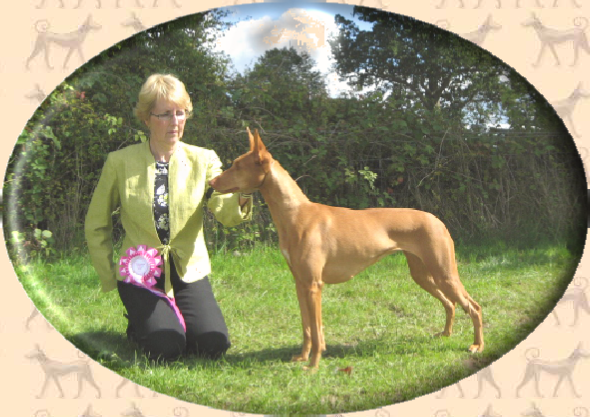 The UK Kennel Club puts the breed into the Hound Group whilst the FCI in Europe classifies the Pharaoh Hound as a primitive breed and sets it in Group 5 with the Spitz and Primitive Breeds. CH. 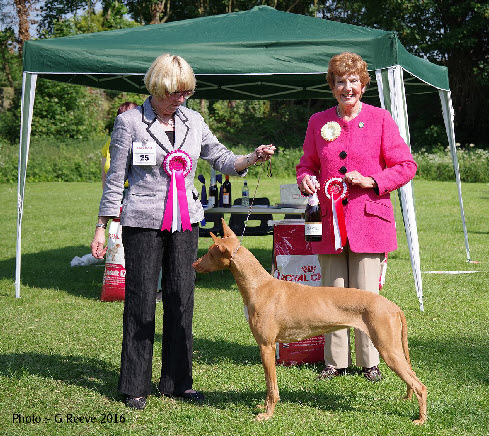 XO Sequin to achieve her CC’s and make a UK Champion. With her third CC at WELKS 2012. Sequin and has now been returned to her owner in the USA. During 2012 and 2013 Jill also handled CH. XO Invincible for Kathy Carella to gain his crown achieving 3 sets of CC’s and a Group 2 at Leeds CH Show Brodie has now returned to Kathy in Canada. CH. XO Invincible “Brodie” before leaving sired two litters in the UK. One for ourselves at Anharbn and the other for Annatefkah. to become part of the Anharbn Kennel. Jill selected Tabby very early in the “nest” from the Annatefkah litter. Sired by CH. XO Invincible “Brodie” before leaving us back to Canada.